TDF! The 97th annual Tour de France starts July 3rd 2010 and all you iPhone and iPad users might be excited to follow the action on your device. The official Versus Tour de France LIVE app brings all the cycling action to you but not for free, although this app is. To get the full benefits of the app, you’ve gotta cough up $15 for the in-app purchase or just buy the live version of the app to get actual content you’re looking for like live video streaming from France. Given the live footage streaming to your iPhone (or iPad 3G) at any time, fans and fanatics of cycling will get a ton of value from their investment. The video quality over WiFi is crystal clear (especially on the iPhone 4), and over 3G you get a slightly degraded video feed which is excellent as well. Videos are broken down into stages and each stage has the live feed (when the race is on) and a series of cut videos that you can watch about predictions, interviews, podium ceremonies, and course previews. As a side note; Microsoft’s Search engine has also created an amazing and powerful Tour de France Bing map that you can use if you’re behind a computer. Worth a look. 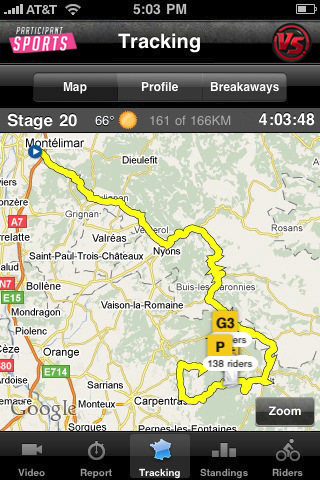 You can grab the free version of the Tour de France iPhone app if you don’t want the live video. AppSafari review of Tour de France LIVE was written by Joe Seifi on July 5th, 2010 and categorized under App Store, iPad apps, Sports, Video. Page viewed 6001 times, 1 so far today. Need help on using these apps? Please read the Help Page. Great app. Watching it now on my iPhone over 3G Live haha I love it. Lance is in 32nd place in stage 3. Latest update crashes. Not good for $14.99 app! This app is really frustrating. I upgraded for the live streaming, and it kicks me out whenever I try to watch ANY video, live or not. Poor value for $14.99, and no advice on how to fix it. Thanks for nothing!